There are many reasons you need to use the faucet day to day, whether you have a regular faucet or a pull-out or pull-down model. Whether you’re cooking or giving the dishwashwer a break from doing all the work in the evening, there are plenty of uses for faucet water and it shows in how much people use per year. In a household of 4 people, faucet water accounts for about 18% of the total household water consumption, which is a lot. Over the course of a year, the average household uses between 6,600 and 9,750 gallons of water. That is a staggering amount, so it goes without saying that it’s important to make sure the faucets in your home are in tip top shape and not ready to give out. Bad faucets that are old and leaky will only increase the gallon output per year, and in the process, can seriously damage the pipes in your home. Below is a summary of faucet water consumption and how it is used around the house, whether in the kitchen or in the bathroom. This will give you a good idea of how important it is to have an updated appliance at the source of the water. The kitchen may rival the bathroom in terms of water consumption, but it is still only the second most used by comparison. At the kitchen sink, users often run water for several tasks, the main ones being boiling and cooking. In this case, users with deep sinks and high-arching faucets are at the biggest advantage. They can simply put their pot in the sink and fill it up with water, and that step can even be avoided completely if they have a water faucet with a spray head. In the modern kitchen, leaving your pot on the stove while you extend the 60-foot+ spray head to fill the pot up with water is even more ideal, so smaller users don’t have to lug a big pot over to the stove. It is an effortless mechanic that often goes unappreciated for years until you purchase a kitchen faucet with a built-in spray head. During foot prep, sometimes rinsing and chopping vegetables is done in the sink with a running stream of water. This is common and is one of the main water uses in the kitchen. The introduction of the spray head with different spray types and a pause feature helps to save water in the kitchen by giving the vegetables an actual rinse in and only when needed. Each model of kitchen faucet has its own spray head settings that may prove more beneficial than others, which is why if you value the spray head option the most, you always want to choose one with at least 3 functions built in for maximum compatibility. Although not to the same extent as in the bathroom, hand washing is also a common use of kitchen faucets, which is even more likely if you purchase a system from Danze that comes with a soap dispenser. If combining this with a motion sensor setup, consumers can wash their hands without ever touching any of the equipment. Especially after handling meat, bacteria growth can be a concern so having a touchless system is even more vital. A noteworthy aspect of using a touchless system is that due to accidental activation from hand gestures, it could waste a lot of water, although this isn’t common. There is a learning curve to using a touchless system, but it will be second nature in no time. The bathroom is the biggest culprit of water use, which is pretty obvious, but would you believe that a bathroom faucet uses much more water than a kitchen faucet? It’s an unbelievable statistic, but makes sense the more you think about it. The first faucet you go to in the morning is the bathroom, and it is also the last one you see at night. If you use any types of creams, shaving gels, toothpaste, or even if you’re just plain washing your hands then chances are the bathroom faucet is going to get a workout. This is not even counting the many miscellaneous tasks that the bathroom faucet is called upon throughout the week like washing out a cut or just washing your face. The bathroom is the biggest consumer when it comes to water usage just on the faucet alone, so image what the number is if you factor in the entire bathroom. One thing that people don’t notice when using the bathroom faucet is that they leave it running a lot more than the kitchen faucet. This may be a force of habit or a mental block, but whatever the reason, the bathroom faucet is left running in overtime more often than not. 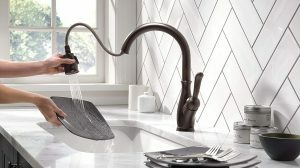 So even though the kitchen faucet is probably the most important faucet between the two, when you’re buying a new kitchen faucet, don’t forget about the most-used faucet in the home — the one in the bathroom. It wouldn’t hurt to replace the most-used faucet in the house and upgrade it to something more fitting for its role. That concludes the insight into where and what faucet water usage amounts to in the normal residential setting. In larger households with more bathrooms and a bigger kitchen, you can expect spikes in water usage from time to time. The important part is to always have a water faucet that can handle the many gallons of water that pass through your home yearly. Whether it is in the bathroom or in the kitchen, having an up-to-date kitchen faucet to handle a heavy load will make things go a lot smoother for you. With all of the innovations surrounding water faucet technology, this would be a good time to see what your home is missing. You may find something that completely blows away what you currently have in your kitchen or bathroom.